The Democrats Killed the John Doe Amendment on Thursday. The Senate democrats agreed (Roll Call HERE) with their House counterparts (who threw the legislation out in committee) that you should be prosecuted if you alert officials of perceived threats on national security. 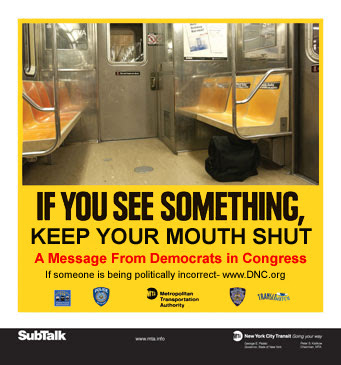 Right on Right put together an updated poster for the New York subways. Remember these the next time you hear a democrat bluff about how they give a hoot about national security. Update: Rep. Peter King (R-NY) blasts democrats for blocking the John Doe Amendment.